In his first winter of arbitration eligibility, Bud Norris settled on a $3MM salary from the Astros for the 2013 season. While $3MM is nothing to sneeze at, it's a stunningly tiny sum when it's the highest salary on a modern team's active roster. That's the way it goes for the Astros, who are paring their payroll down to miniscule size (and their roster to miniscule size in terms of talent, as their 11-30 record indicates) in order to completely rebuild their franchise. When a team is having a fire sale on prominent veterans, it only stands to reason if the next step is to move absolutely every asset, even a 28-year-old right-hander who is under team control through the 2015 season. While Houston has been open to hearing offers for anyone, GM Jeff Luhnow has said that "it would take a significant offer to even consider something" involving Norris or Lucas Harrell. While the Astros aren't interested in posting a respectable record now, they also don't want to go 0-162; a couple of decent arms are still needed who can eat innings, give the bullpen a rest and keep the team in games as best they can. There's also the fact that Norris hasn't been doing much for his trade value thus far in 2013. Norris has a 4.32 ERA, 5.9 K/9, 3.2 BB/9 and only a 38.8% ground ball rate through his first nine starts. He is also facing some injury uncertainty, as the righty left his most recent start with back spasms. While Norris is the Astros' nominal ace, he would receive a trade return befitting a fourth or fifth starter, so Houston might feel like Norris has more short-term value to them on the mound than he would as trade bait. That said, Norris is still a 28-year-old with a 91.8 mph fastball who averaged 169 innings and 8.8 K/9 from 2010-2012. There would definitely be teams interested in seeing if Norris could blossom outside of the Astros' dire situation. If not a starter, then Norris could perhaps have value as a reliever — ESPN's Jayson Stark reported earlier this month that many teams feel Norris "profiles more as a bullpen weapon on a contender." A team like the Tigers, for example, who is looking for bullpen help and also for starting pitching depth (though Rick Porcello has pitched better as of late) could pursue Norris a solution to both problems. Since the Astros seem at least three years away from contending, Luhnow seems to have taken the position that unless a player stands a solid chance of still being a productive force on "the next good Astros team," that player should be moved. 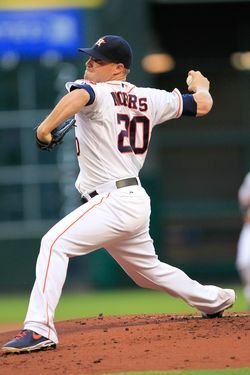 Norris is scheduled to hit free agency after the 2015 season and he'll be 31 years old on Opening Day 2016, so that might already make him too old to be considered a viable part of the next generation of Astros baseball. A few consistent starts and a clean bill of health leading up to the July deadline would raise Norris' value and maybe make it worthwhile for Luhnow to consider making yet another move for the future.